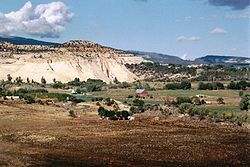 Boulder is near Grand Staircase-Escalante National Monument and Capitol Reef National Park. In the town, the population was spread out with 30.0% under the age of 18, 11.1% from 18 to 24, 26.7% from 25 to 44, 21.1% from 45 to 64, and 11.1% who were 65 years of age or older. The median age was 34 years. For every 100 females, there were 104.5 males. For every 100 females age 18 and over, there were 103.2 males. Wikimedia Commons has media related to Boulder, Utah.